Each edition of the five-part Art on Film/Film on Art anthology explores a single theme in the creation of art using the medium of film. Each volume includes three short productions commissioned by the Program for Art on Film as well as insightful commentary and conversations from film experts and expert filmmakers. 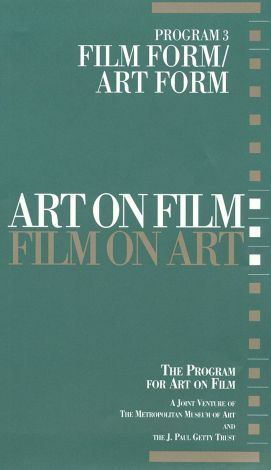 Art on Film/Film on Art, Program 3 -- Film Form/Art Form explores the relationship between the composition and structure of the work of art to the structure of a film about that work of art. Also examined is the application of experimental film techniques in interpreting works of art. Included in this edition are Leonardo's Deluge by Mark Whitney and Carlo Pedretti; A Mosque in Time by Edin Valez and Jerrilynn Dodds; and Saint-Genevieve, The Pantheon of Domes by Nadine Descendre and Barry Bergdoll.